1. Heat a tblsp of oil in a large pan over medium flame. 2. Cook the capsicums for 3 to 5 minutes. 3. Add the onions and cook for another 3 minutes. 3. Now add the garlic and reduce flame to low. 4. Cook until all vegetables are tender, about 5 to 8 minutes. 5. Transfer them to a large bowl. 6. Add 1/4 cup of enchilada sauce, corn, olives, salt, cumin powder and coriander powder. 7. 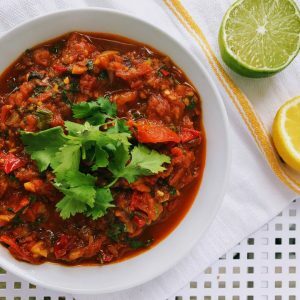 Place the remaining enchilada sauce in a small pan and warm. 8. Transfer to a round cake pan. 9. Dip the tortillas, one by one, in the warmed sauce on both sides and transfer to a plate. 10. Spoon about 1/4 cup of the mixture in the center of the tortilla. 11. Roll tightly enclosing the filling. 12. Transfer them to a baking pan, seam side down. 13. Repeat with the other tortillas, making 2 rows in the baking pan. 14. Pour the leftover sauce over, covering them evenly. 15. Sprinkle cheese and bake in a preheated oven at 350F for 10 to 15 minutes or until a knife inserted in the middle comes out clean and hot. 16. Garnish with spring onions. 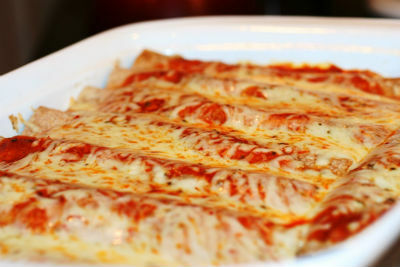 Feel free to comment or share your thoughts on this Veggie Enchiladas Recipe from Awesome Cuisine.